Before September 2013, I hadn't really listened to audiobooks except for a couple of Harry Potters that I had bought for road trips. I was one of those jerky readers that didn't believe that listening counted as reading. I also didn't want to sit at my computer for hours on end and I didn't have a commute. Then came Ready Player One and the discovery of the Overdrive subscription through my wonderful library system. I couldn't resist listening to Wil Wheaton as narrator of an instant geek classic and thus began my conversion. 1. Middle grade, YA, or genre fiction: I tried listening to Victoria: A Life but I just couldn't keep up with names and timelines on audio. I needed the ability to look at relationship charts and photos. I need plot-driven fiction! I did listen to the Amy Poehler memoir but that was entertainment non-fiction, not the learning type. 2. A narrator with a good accent and good representation of various characters: I tried a theater group performance earlier this year and they were just too dramatic for me. There was also a Judy Blume book that I listened to where the adult narrator just made all of the kid voices whiny. It was awful. 3. The ability to listen on 1.25x or 1.5x: I am impatient and I don't want a book to last more than a few days. There have only been one or two times that I couldn't understand the narrator when I sped up a book. I started by listening while taking walks and then added in some time during housework and yardwork, when settling down for a weekend nap, and finally just while sitting in the sun on a beautiful sunny afternoon. I've even been known to listen to the end of a great story through an entire evening. One of the best things I've found about audiobooks is that I can actually listen to one book while having a different physical book in progress. I used to be a monogamous reader but now I have fun dipping into multiple stories through different mediums. Somehow, I'm able to keep the stories separate this way. The only thing I'm apparently not able to do is remember to review my audiobooks because they don't end up on my review stack. Oops. Do you listen to audiobooks regularly? Do you have a favorite that I should try? Ready Player One is a wonderful audio gateway drug. I love audiobooks. I usually either listen to fantasy or nonfiction. Your points are all very important to me, too. It's got to be the right narrator, the right kind of book, the right speed. Kate Reading is one of my favorites. Some books I just find better on audio. And I'm REALLY picky about children's and YA because of the whiny factor. 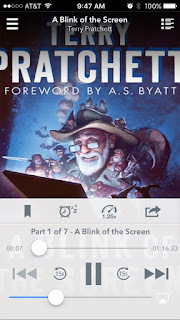 I love The Night Circus and the Howl books on audio! Why does nobody making the books have a problem with the whiny kid thing? Do they think that's what kids actually sound like? There are many great narrators that can do kid voices. It doesn't have to be bad. I love audiobooks, but I so agree with you that you have to find the type of books that suit you. 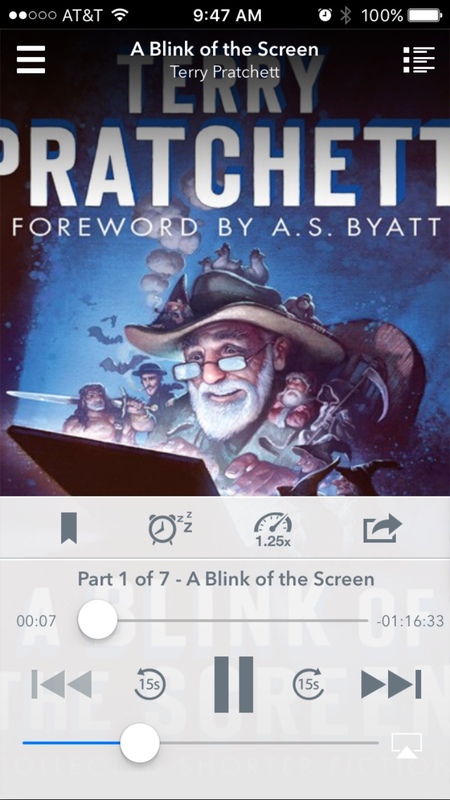 I rarely-to-never listen to audiobooks, because I'm never in one place long enough to listen to them, hahaha. Does listening to it at higher speeds interfere with your experience of the reader's performance? Or does it sound pretty much the same? It wasn't until recently that I had "time" to listen either. You really need enough time to get into the book. If I just get a 10 minute snippet and then get interrupted, I usually end up going back and relistening. So, most of the readers seem to do a very clear, slow pace and speeding it up actually just makes them sound more normal. The pitch of their voice changes a little bit but like Amy Poehler still definitely sounds like herself. It's not until 1.5x or faster that it starts being faster than a conversational pace. Sometimes I try 1.5x but my brain just can't process all the words that fast. Yes, it has to be the right book. They don't all work for me either. My fave: The Scorpio Races by Maggie Stiefvater. Great story, great dual narration. I want to read it in print someday. I am planning on reading Ready Player One in print this summer. I usually catch different things in audio versus print. Yay yay yay!!!! :) It took me a while to get into audiobooks and I still find that sometimes my brain just doesn't want to process them, but I LOVE audio and it's such a great way to add reading when you can't actually sit with a book. And like you said--it allows me to be a bit more promiscuous. LOL! Normally I'm a one book gal as well but make an exception for audio (though I do like reading and listening to the same book if I can...like those huge Stephen King books). Nonfiction actually works really well for me because if I tune it out, I haven't lost any big plots. It definitely has to be the right kind, though. Bill Bryson's are short and very interesting. Same with Mary Roach. Anthony Bourdain is another great one on audio. I find that I'm much more willing to listen to some things that I wouldn't necessarily make time to read in print. I really enjoyed Howl's Moving Castle when I listened to it. I'm actually putting up my post on Fire and Hemlock tomorrow (I know) and was so bummed that one wasn't on audio. And yes--1.25x at least. Regular speed sounds so slow!!! And Mary Roach is a great idea for audio! I have a few of her books left to get to.